Every once in a while I come across a phenomenal resource that I want to share, and VentureRadar is just such a site. 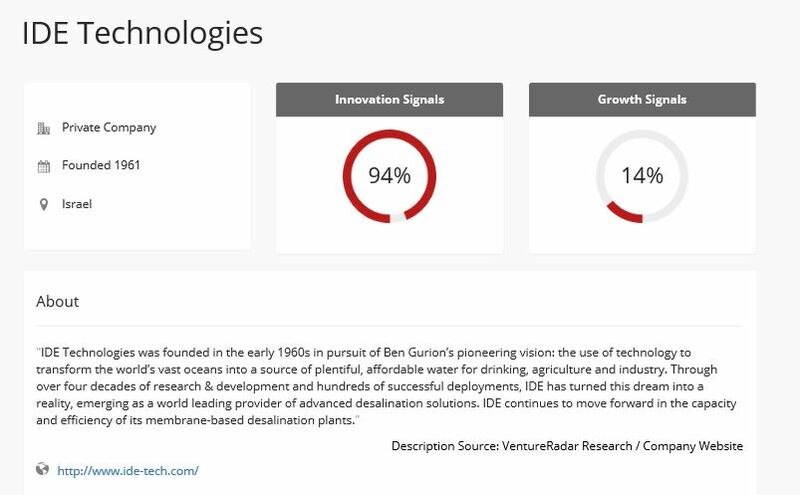 If you want to find out which companies are leading the way in disruptive and innovative technologies, VentureRadar will crawl through publicly available data and show you who’s hot. The Company was founded by Andrew Thomson, PhD who contributed to the building of an online intelligence tool used by Dow Jones. His team also includes two PhDs and a Masters Degree – their knowledge spanning artificial intelligence, machine learning, mathematics, statistics, and science. It’s basically a search engine. Type what you’re looking for and let the magic unfold. For example, if I type in the phrase, “Wearable” I get these results. If I click on the first company, Wearable Intelligence, I get this report which is shown below as well. 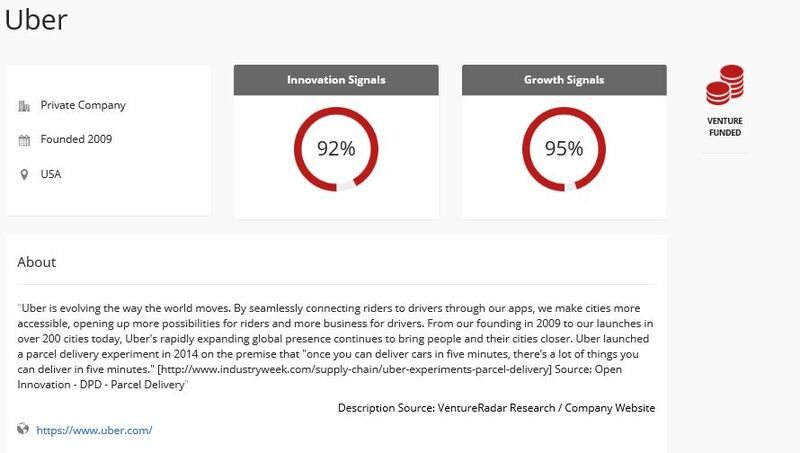 “Innovation Signals: There are two elements we consider when measuring innovation: proprietary technology/skills/business models, and the potential for disrupting industries. Highly rated companies can include both established or even consulting based companies (so for example a contract R&D company would be often be considered innovative) as well as disruptive start-ups. On the flipside, there are companies like well established IDE Technologies, leaders in water desalination. In my opinion, VentureRadar is a pretty amazing platform for locating those companies that could be competition, or partners. It is also a valuable resource if you’re looking to map how a certain technology will develop over the next 5 years. Once you can see where things may be going, your strategic and scenario planning can take that into account, giving you a better feel for the accuracy of future scenarios. I’ll be using this for sure in my work. Pay them a visit. I’d love to hear what you think about VentureRadar. You know how much I like music. You also know how I like using parallels from other industries to supplement what I do. I came across a great article from BMI (that happen to be the Performing Rights Organization that I belong to) that discusses 7 things to look for in improving one’s lyrics. After all, a song has less than a few minutes to hook you and if the lyrics don’t work, the song doesn’t work. It dawned on me that focusing on these 7 facets can also improve your products/services. Is everything you’re writing related to the hook/message of the song? Is everything in the design related to the message/meaning of the product? What message or vibe do you want your product to convey? Are buttons, directions, colors, shapes, feel, smell all working together to convey the same message? Have you used details in your verses? Have you used details appropriately in the product? Architect/Designer Charles Eames said, “The details are not the details. They make the design.” Details call attention to the various centers of a product. They can work together or provide distraction. Have you already said it? Are there unnecessary redundancies in the product? Not only is excess information (excess detail) annoying it can be confusing and lead to errors in use. Have you said enough? Just as saying too much is a problem, not saying enough is equally bad. Designers can assume that a person using a product knows everything the designer knows about the product: the context of use, how it works, etc. These assumptions can then covertly get built into the design resulting in frustration and product misuse. As a designer ask yourself, “Does using this product require knowledge that only I have? Will the person using this say, ‘I didn’t know I had to do x for y to work! '” If the answers are “Yes” or “Maybe” then find a way to overtly communicate that knowledge. Is your chorus lyric the main message of your song and is it memorable? The chorus is the part of the song that most people remember and join in singing. It sticks in our heads. Is the main use of the product memorable – does it get stuck in your head? Does the product create a type of obsession? Do you want to go back for more? Do your words sound good sung? Does the product communicate naturally? Is the product communicating in ways that are congruent with the desired experience? Is there a unified brand experience? Does something seemed forced about the product interaction? Are the little words like “and,” “but” & “’cause” used properly, or can they be removed altogether? Every action leads to an action and/or reaction. Do I have to press this and hold that to make something work? If I swipe but don’t use four fingers will it cause something undesirable to happen? Does everything in a product get straight to the point? If it doesn’t, it should be by design, not by accident. Little words like “and” and “but” create connections that can lead to confusion and a lack of intelligibility. If they can be removed, remove them. If you can’t remove them, make sure that each “and” or “but” in the product design is important and essential.